TAUNTON, Mass. – Taunton went into halftime of Wednesday night’s season finale trailing New Bedford by two but the Tigers stormed out of the locker rooms for the second straight game and took control. They opened the second half with a 23-3 run and pushed the lead as high as 18 in the third quarter. The Whalers did not lie down and came right back with a 16-5 run and twice got the Taunton lead down to four points in the final quarter, but the Tigers held onto their lead and pulled out a 62-54 victory, giving Taunton back-to-back wins to end the season. Although neither team will be heading to the playoffs this year, and despite Taunton missing three starters, the game got off to a fast pace. Both offenses clicked into gear and both teams were using high pressure on the ball to try and create transition opportunities. Senior Alexa White scored the game’s first five points, but New Bedford stayed close behind nine points from Andrea Segura (14 points). Jaelyn Fernandez (nine points) also got off to a strong start for the Tigers, scoring seven points in the first, including a basket off an Abby Souza (11 points) assist that tied the game 17-17 after one. The second quarter slowed down considerably. Sonya Fernandez grabbed an offensive rebound and scored to make it 21-19 after more than four minutes were gone in the second. After New Bedford tied it, Taunton went on a 5-0 run, including a steal and layup by White and a jumper by Thalia Nogueira. New Bedford came right back with a 7-0 run of its own and hit a jumper with the clock winding down to go into halftime ahead 28-26. Everything worked for the Tigers in the third quarter. The defense was forcing turnovers left and right and the offense was making shots. Taunton turned the game on its head and pulled away for what seemed like an insurmountable lead. White got it started with a transition basket off of a Souza pass and then Souza got a steal and layup of her own. White drilled a three after Kyanna Barros kept the possession alive with an offensive rebound and then Barros grabbed another board and finished to put Taunton up seven. After a New Bedford basket, Sonya Fernandez took the ball to the basket and then Souza drained a three. White turned a steal into an easy basket, Fernandez got a layup off a Barros pass, and then Nogueira set up Souza for a basket with a rebound and scoop pass in traffic. Taunton had the chance to put the game away but the Whalers got some hope from Monica Eires (17 points), who hit the third of her five three-pointers. In the fourth quarter, New Bedford rallied behind four points from Segura and a pair of threes from Eires. White (18 points and five assists) scored off a Braeley MacDonald assist to push the lead back to six points and then Fernandez (18 points and 12 rebounds) showed strength in the post to answer another basket by the visitors. A pair of free throws by Fernandez and another layup for White sealed the victory and gave the Tigers a positive end to the season. Taunton closed the regular season at 7-15. Canton, 65 vs. Bishop Feehan, 59 – Final – Canton scored 20 points in each the second and third quarters, the latter helping the Bulldogs build a double-digit lead heading into the final quarter. Bishop Feehan made a late push but the Bulldogs were able to hold the lead they built. The Shamrocks led 16-13 after one but Canton led 34-30 at half, and 54-38 going into the fourth. Senior Devin Foster scored a game-high 27 points and junior Kyle Fitzgerald added 10 of his 17 points in the third quarter. Foxboro, 50 vs. Boston Latin, 48 – Final – For the second straight game, Foxboro hit a buzzer-beating three to get a win. This time, it was senior Anthony Mollica (10 points) hitting a triple off a feed from Brandon Borde (eight points) to give the Warriors a win. Boston Latin led 42-39 heading into the fourth, and extended that lead to 46-39 with five minutes to go. Foxboro was able to hold Boston Latin to just six points in the final quarter, finishing the game with a 11-2 run. Sophomore Kevin Gallagher had a team-high 15 points while junior Ryan Hughes added 11 points. King Philip, 79 @ Dartmouth, 59 – Final – King Philip scored 23 points in each the first and second quarters, building a 46-32 lead by halftime, and never looked back to grab the win. Senior Bruce Saintilus had a team-high 22 points, junior Alex Fritz netted 21 points, and senior Tyler Nault dropped a career-high 15 points for the Warriors. Oliver Ames, 69 @ Walpole, 41 – Final – Oliver Ames outscored Walpole 22-8 in the second quarter to create a large lead at halftime that it never relinquished. The Tigers led 15-11 after eight minutes but then exploded for 22 points to go up 37-18 at the break. Eight different players scored in the second for OA, with Sean O’Brien, Owen Friel, and Michael Greene each connecting on a three. Ethan Eckstrom had a team-high 17 points for the Tigers, which had 13 players score. Ryan Burkett added eight points and Amari Brown finished with seven points. Canton, 57 vs. Weymouth, 48 – Final – Click here for a Recap and Photo Gallery from this game. 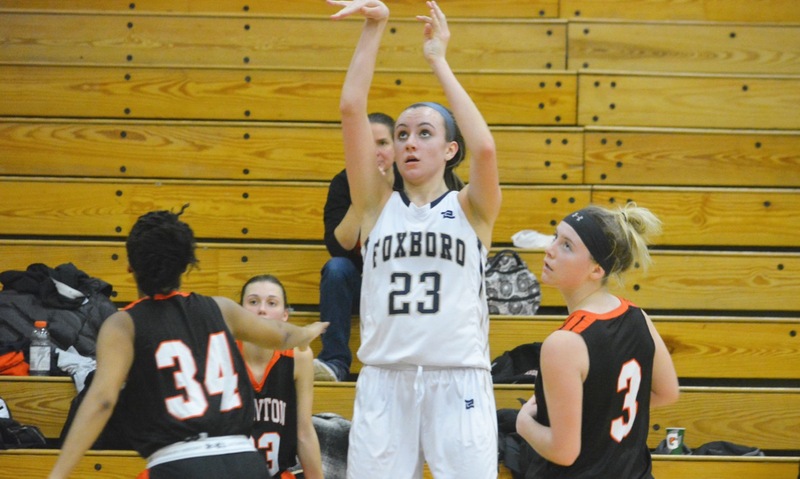 Foxboro, 61 vs. Hoosac Valley, 48 – Final – Chelsea Gibbons scored a career-high 26 points to help Foxboro retain the title at the Warrior Classic and put the defending state champs in position to be the top seed in Div. 2 South again this season. Katelyn Mollica added 18 points for the Warriors and Lizzy Davis shut down Hoosac Valley’s top scorer, holding her to only five points. Stoughton, 56 vs. Brockton, 49 – Final – Stoughton closed out its old gym with a non-league victory. Aliyah Wright scored 13 points and Sydnee Hyacinthe added 12 as the Black Knights ended the season on a high note. Lexi Baptista also chipped in with nine points off the bench. Taunton, 65 @ Durfee, 51 – Final – Taunton trailed by 11 at half but exploded for 44 second half points to stun Durfee. The Hilltoppers led 33-21 after 16 minutes of play before the Tigers rallied to grab the win. Sonya Fernandez scored a team-high 18 points, Alexa White added 13 points, Jaelyn Fernandez had 12 points, Kyanna Barros chipped in with 11 points and 11 rebounds, and Abby Souza scored nine for the Tigers. Canton, 3 vs. Boston Latin, 2 – Final (OT) – Canton junior Johnny Hagan netted the tying goal and then scored the game-winner in overtime for the Bulldogs. Hagan scored with 1:16 left in the game to help the Bulldogs salvage a tie for MIAA purposes, staying unbeaten on season. For Joe Quinn Memorial Tournament purposes, the game went into 4-on-4 overtime and Hagan tipped in a shot from Jack Connolly to get the win and advance to the finals on Thursday at 7:30. Stoughton, 1 vs. Nauset, 5 – Final – Stoughton goalie Thomas McCoy had an outstanding goal in net but the Black Knights lost to visiting Nauset. McCoy turned away 32 shots for Stoughton while Sean Doherty scored the goal on an assist from Luke Bainton. Taunton, 54 @ Attleboro, 61 – Final – After a close first half, Attleboro used a 22-point third quarter to create the separation it needed to fend off visiting Taunton. The Bombardiers led 14-13 at one, and 30-26 going into the halftime break. Junior Bryant Ciccio scored eight of his team-high 18 points in the third quarter in his return from injury to help spark the Bombardiers, who connected on 10 three-pointers in the game. Qualeem Charles (10 points, 13 rebounds) and Mason Houle (12 points, six rebounds) each added four points apiece in the third to help Attleboro pull away. Taunton junior Naz Kenion scored a career-high 19 points, with eight coming in the final quarter as the Tigers made a push to get back into the game. Dante Law added 12 points, with 10 coming in the second half. Canton, 43 @ North Attleboro, 38 – Final – Click here for a recap and photo gallery from this game. Foxboro, 78 @ Sharon, 48 – Final – Foxboro sophomore Kevin Gallagher poured in a career-high 28 points as the Warriors ran away with a win on the road. Gallagher dropped 12 points in the opening quarter and junior Brandon Borde scored nine of his 16 points in the first as well as Foxboro built a 21-12 lead to start. Gallagher added five threes between the second and third quarters to help Foxboro take a 60-32 advantage into the final quarter. Sharon senior Keenan Delouis had a team-high 12 points, include three three-pointers in the second quarter. Oliver Ames, 50 @ Franklin, 58 – Final – Franklin scored 20 points in the final quarter to pull away from Oliver Ames to earn the win. The Tigers kept pace with the Panthers through the first three quarters, knotted at 14-14 after eight minutes and trailing by just three at half (25-22) and after three quarters (38-35). Franklin junior Chris Edgehill scored nine of his game-high 19 points in the fourth quarter, Jalen Samuels netted a third of his 15 points in the fourth, and Jack Rudolph (10 points) went 4-for-4 from the line to help the Panther secure the win. OA sophomore Amari Brown had a team-high 12 points while senior Jake Erlich added 11 points and senior Ethan Eckstrom finished with 10 points. Mansfield, 74 @ King Philip, 58 – Final – King Philip scored 20 points in the third quarter to make it a three-point game entering the fourth as the Warriors aimed for a season sweep of the visiting Hornets. But Mansfield’s offense exploded in the fourth quarter, connecting on six three-pointers and scoring a total of 27 points in the final frame to run away with a victory to split the season series. Junior Sam Stevens (eight rebounds) had two threes in the fourth, scoring 11 of his team-high 28 points in the quarter while senior Tommy Dooling (seven assists) splashed in three triples for nine of his 19 points. KP junior Alex Fritz (six rebounds) scored a career-high 28 points, including 13 points in the third quarter to get the Warriors back into the game. Andrew McKinney added 10 points and seven rebonds while Bruce Saintilus finished with six points, eight rebounds, and four assists for KP. Stoughton, 55 @ Milford, 65 – Final – Milford poured in 27 points in the final quarter and limited Stoughton to eight points in the fourth to erase a double-digit halftime deficit to earn the win. The Black Knights led 16-9 after one an took a 36-24 advantage into halftime, but the Scarlet Hawks got within eight (47-39) to start the final quarter and senior Brendan White took over the in the fourth to lead Milford to a comeback win. White sank four three-pointers in the fourth, scoring 15 of his game-high 26 points in the quarter to spark the comeback. After being held without a field goal in the first, White scored six points in the third to help Milford inch closer. Danny Corsini added 14 points for Milford. Myles Grigalunas-Powell paced Stoughton with 18 points and Obinna Ugwuakazi added 14 points for the Black Knights. Attleboro, 61 @ Taunton, 52 – Final – Attleboro led by just two points heading into the fourth quarter but outscored the Tigers by seven in the final eight minutes to pull out the road win. Jordyn Lako scored a season-high 23 points and snagged 12 rebounds for the Bombardiers. Jaelyn Fernandez scored 17 and Alexa White had 13 for Taunton. North Attleboro, 39 @ Canton, 52 – Final – After allowing the Rocketeers to make 10 three-pointers in the first meeting, Canton did a much better job defending the perimeter, limiting North to just two made threes and only 13 points in the first half to pick up the win. It is the 12th win of the season for the Bulldogs, one away from tying their most wins in a season since 1993. Tayla DeGraw had a great game in her varsity debut, according to head coach Jim Choquette. Sharon, 34 @ Foxboro, 64 – Final – Katelyn Mollica scored 23 points and Abby Hassman added 10 to lead the Warriors to a big league win. Franklin, 53 @ Oliver Ames, 51 – Final – Click here for a Recap and Photo Gallery from this game. King Philip, 66 @ Mansfield, 51 – Final – KP jumped out to a 13-point lead in the first quarter and extended it to 19 by halftime, holding the Hornets to just 14 points at the break. But Mansfield closed the gap in the second half, getting the lead down to as little as seven points to start the fourth quarter. The Warriors closed out the win by shooting 8-of-10 at the line in the fourth. Faye Veilleux scored 21 points and Faith Roy continued her strong play in the last week with 16 for KP. Julia Leroux and Emma Glaser each scored seven points in the win. Sydney Mulkern, Maggie Danehy and Mady Bendanillo each scored eight points for the Hornets, while Emily Vigeant added seven. King Philip, 8 @ Attleboro, 2 – Final – King Philip senior Brendan Shandley recorded six points as the Warriors skated to a big league win on the road at Attleboro. Shandley netted a hat trick and added three more assists, Conor Cooke had a pair of goals and a pair of assists, and Chris Daniels finished with a goal and three helpers for KP. Canton, 4 vs. Hanover, 3 – Final – Canton scored three goals in the third period to hand Hanover just its second loss of the season and the Bulldogs improved to 18-0-0 on the season. The Bulldogs opened the scoring less than a minute into the game off the stick of Timmy Kelleher but Hanover tied the game just a minute later. Ryan Nolte put Canton back ahead with a shorthanded goal early in the second but the Indians tied the game just two minutes later on the power play. Johnny Hagan put Canton back on top with just under five minutes to go in the second and Chris Lavoie made it 4-2 just 39 seconds later. Hanover scored four minutes into the third and had a power play in the middle of the period but Canton killed it off and secured the win. Oliver Ames, 1 @ Newton South, 4 – Final – Oliver Ames peppered the Newton South net with 49 shots and outplayed the hosts but could only find the back of the net once in a loss on the road. Newton South converted on a pair of deflections on shots from the point and a breakaway while senior Matt Mullaley made 20 saves in goal. Jake Gottwald had the lone tally for Oliver Ames. Taunton, 11 vs. Durfee, 1 – Final – Taunton’s Mike Albert recorded five points and Cam Sneyd added four as the Tigers ran away with a win over visiting Durfee. Albert scored once and had four assists while Sneyd found the back of the net four times. Jordan Couto added a pair of goals while Colton Scheralis netted his first career goal in the win. Canton, 8 @ Stoughton, 0 – Final – Maggie Malloy scored her 100th career point and the Bulldogs recorded a fifth straight shutout. Franklin, 2 @ King Philip, 1 – Final – Cassi Ronan and Regan Paterson each scored for the Panthers to earn the road win. Paterson and Amanda Lewandowski each had an assist for the Panthers. Today’s game is listed below. Taunton, 59 @ New Bedford, 45 – Final – Alexa White led the Tigers with 17 points, while her sister Kelsey had nine points and seven steals to help the Tigers pick up the road win. Lily Patneaude added 12 points and Jaelyn Fernandez had 10 for Taunton. Mansfield, 62 @ Attleboro, 63 – Final (OT) – Attleboro junior Bryant Ciccio (24 points) hit a couple of clutch free throws between the end of regulation and the overtime period to help the Bombardiers earn the win. Mansfield senior Tommy Dooling (16 points) converted a putback with eight seconds left to give the Hornets a 58-57 lead but Ciccio hit a free throw with 0.6 seconds left to send the game into overtime. The Hornets held a 62-59 lead with under a minute to go in the extra period but a steal and layup from Mason Houle (10 points) made it a one-point game with 32 seconds to play. After getting a stop, Ciccio hit two free throws to put Attleboro up 63-62. The Bombardiers forced a backcourt violation, got the clock down to 2.4 seconds, missed a pair of free throws but prevented Mansfield from getting a shot off at the final buzzer. “I’m proud of our effort, we stayed together and made big plays tonight in crucial situations on both ends of the court,” said Attleboro head coach Mark Houle. “We made it a priority to make the next play and didn’t panic.” Qualeem Charles added 15 points for Attleboro while Tim Callahan had 10 points. Damani Scott added 16 points and Matt Boen finished with 11 points for the Hornets. Foxboro, 60 @ Canton, 65 – Final – Canton outscored Foxboro 43-31 between the two middle quarters, helping the Bulldogs turn an early deficit into a lead it never relinquished. Junior Kyle Fitzgerald scored 14 of his 16 points in those two periods while senior Devin Foster spread his 16 points out among all four corners. Ryan Lentol connected on four three-pointers for a career-high 14 points while Robbie Gallery added nine for Canton. Foxboro sophomore Kevin Gallagher scored a team-high 14 points, senior Anthony Mollica added 13 points, and junior Brandon Borde finished with 12 points. King Philip, 39 @ Franklin, 62 – Final – After scoring 21 points in the first half, Franklin exploded for 21 points in the third quarter along to pull away from the Warriors. The Panthers led 21-13 at half but held a 42-29 advantage through three quarters. The Panthers added 20 more points in the final frame. Junior Chris Edgehill netted a team-high 16 points while Jack Rudolph added 14 points and Thomas Gasbarro finished with 13 points. Alex Fritz had a team-high 13 points for King Philip. Sharon, 51 @ Milford, 66 – Final – Holding a three-point lead at halftime, up 28-25, Milford opened the second half with a 12-0 run and never looked back in a win over Sharon. Milford senior Brendan White poured in a career-high 29 points while hauling in 14 rebounds to pace the Scarlet Hawks. Brendon Sailer scored nine of his 13 points in the third quarter to help the Hawks create separation. Colby Pires and Jordan Darling pitched in with eight points apiece. Aidan Kane scored a team-high 12 points for Sharon with Ben Kaplan and Caleb Gayle each chipping in with eight points each. Stoughton, 45 @ North Attleboro, 44 – Final – Stoughton junior Ajahn Rue hit the game-winning three pointer with 1.8 seconds left to lift the Black Knights to the win on the road. Stoughton led 42-41 late in the game before North Attleboro junior George Ladd drained a three to put the Rocketeers ahead 44-42. On the ensuing inbounds, Rue (12 points) brought the ball up and pulled up for the three to put the Black Knights back ahead. Stoughton junior Myles Grigalunas-Powell scored 13 of his game-high 17 points in the second half, helping the Black Knights rally from a 26-19 deficit at half. Evan Rosenberg led North Attleboro with 12 points and Nate Gonsalves chipped in with 10 points. Taunton, 53 @ Oliver Ames, 50 – Final – Click here for a recap and photo gallery of this game. Attleboro, 51 @ Mansfield, 63 – Final – Maggie Danehy had a career-high 27 points and grabbed 13 rebounds for the Hornets, helping Mansfield earn its first league win of the season. The Hornets trailed after the first quarter but an 18-10 second pushed Mansfield ahead for good. Sophomore Ashley Santos also had a career-high with 11 points in the win and Becca Hottleman had eight points and four assists. Attleboro was led for the second game in a row by Mackenzie Roberts, who scored eight, while Jordyn Lako and Liv McCall each had seven points. Canton, 61 @ Foxboro, 86 – Final – Click here for a Recap and Photo Gallery from this game. Franklin, 62 @ King Philip, 34 – Final – Ali Brigham continued her strong start to the season, scoring 28 points to lead the Panthers to a second straight win. Franklin jumped in front 46-14 after three quarters with Megan O’Connell adding 19 points and Bea Bondhus scoring six. KP was led by Faye Veilleux with 14 points. Milford, 41 @ Sharon, 54 – Final – Telishya Herbert scored a game-high and career-high 30 points, sparking the Eagles to their first win of the season. Emma Eberhardt added eight points in the win. Emma Lawrence scored 22 of Milford’s 41 points in the loss, which was a career-high for her, and Katie Maietta had eight in the loss. 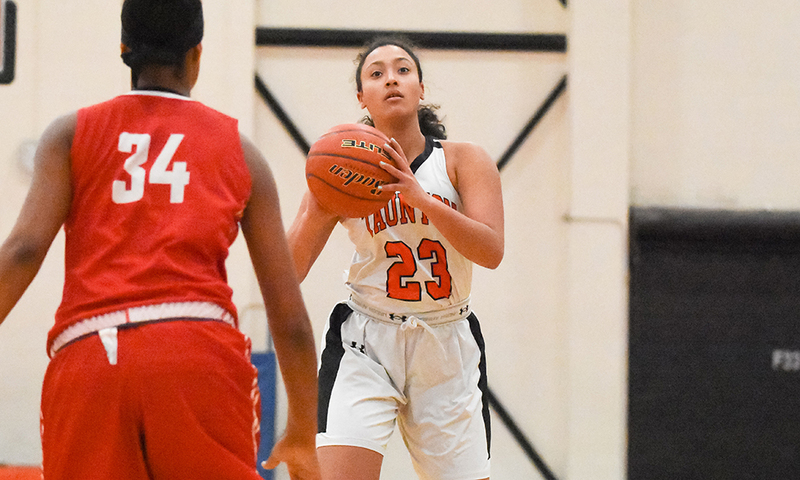 North Attleboro, 51 @ Stoughton, 62 – Final – Sophomore Sydnee Hyacinthe bounced back from a tough opener against OA with 19 points, seven assists, and four steals, while junior Aliyah Wright had 18 points and eight rebounds to get the Black Knights their first win of the season. Senior Lindsay McDonald double-digit rebounds for the second straight game, pulling down 18 boards in the win. Oliver Ames, 63 @ Taunton, 51 – Final – OA pulled away late in a close game that featured a lot of runs from both sides and moved to 2-0 on the season. Senior All Scolnick paced OA with 22 points and classmate Sadie Homer ran the game at the point for the Tigers. Taunton was led by Jaelyn Fernandez with 17 points and Sonya Fernandez with 12. Foxboro, 36 @ Taunton, 49 – Final – A sophomore, a freshman, and an eighth grader all won a pair of events to lead the Tigers to a win in their first meet of the season. Sophomore Garrett Rainey won both the 200 free and the 500 free, freshman Tim Luc won the 200 IM (2:20.92) and the 100 fly (59.12), and eighth grader Gerald Grealish touched first in the 100 free (59.21) and 100 breaststroke (1:12.13). Taunton’s 200 medley relay of Brady Callahan, Peter Ye, Tim Luc, and Martin Dafov and 400 free relay of Callahan, Grealish, Ye, and Luc both took first. The Warriors took first and second in the 200 relay with Ben Dorman, Thomas Perry, Dimitrios Davis, and Thomas VanDell taking first in 1:57 and the team of Jared Roke, Kris Andersen, Spencer SanBento, and Joseph St. Pierre coming in second. VanDell added a second place finish in the 50 free for Foxboro. Foxboro, 53 @ Taunton, 41 – Final – Foxboro took first place in six individual races and one relay race to earn a victory over Taunton. Pam Nelson and Lindsey Nelson earned a pair of wins, with Pam touching first in the 200 IM (2:31) and the 100 free (1:02) and Lindsey winning the 500 free (6:21) and 100 breaststroke (1:24), Sarah Egan won the 200 free (2:29) and Gina Ouellette earned first in the 100 fly (1:14). Foxboro’s 200 relay team of Nelson, Nelson, Ooullette and Egan earned first in 2:01. For Taunton, freshman Angelina Lynch won the 50 free (27.12) and eighth grader Tiffany Ye won the 100 backstroke (1:09.42). Taunton’s 200 medley relay of Jacalin Gallagher, Ye, Marisa Gay, and Lynch and the 400 free relay of Gallagher, Macey Jorge, Gay, and Ye both took first place. Franklin, 73 @ Stoughton, 31 – Final – Franklin’s 200 free relay team of Heather McCarthy, Alyssa LaPuma, Katie Chew, and Katie Cashin qualified for sectionals with a time of 1:53.97. Canton, 55 @ Attleboro, 59 – Final – Attleboro built a 12-point lead by halftime but Canton chipped away in the second half, making it a one-point game late in the fourth quarter. Bombardiers junior Bryant Cicco (17 points) answered with a layup with less than a minute to play to extend the lead to 58-55 and junior Qualeem Charles (13 points) hit a free throw in the final moments to ice the win for Attleboro. Mason Houle added 13 points and Tim Callahan chipped in with 11 points with three three-pointers for Attleboro. Canton senior Devin Foster scored a game-high 27 points, including 16 in the second half, to help the Bulldogs get back in the game. Robbie Gallery added 11 points for Canton. Foxboro, 42 @ Mansfield, 57 – Final – Click here for a recap and photo gallery of this game. Milford, 29 @ Franklin, 64 – Final – After a slow first quarter for both teams (8-4 Panthers), Franklin built a 25-12 lead at halftime and kept that lead the rest of the way in a win over Milford. Franklin junior Chris Edgehill scored 17 of his game-high 25 points in the second half to keep the Panthers ahead while Jalen Samuels chipped in with 12 points. Franklin had five players score in a 17-point second quarter that helped create the separation. Senior Brendan White led the Hawks with 15 points. North Attleboro, 48 @ Taunton, 73 – Final – Taunton had a strong start to both the first and third quarters to earn a win over visiting North Attleboro. The Tigers put up 26 points in the opening quarter with six players scoring a field goal, and took a 43-29 lead at halftime. Taunton opened the second half with an 11-2 run and never looked back. Tigers junior Dante Law scored 11 of his game-high 21 points in the third quarter to help Taunton pull away. Naz Kenion (12 points), Lou Vendrell (11 points), and John Martins (10 points) all scored in double-figures for Taunton. North Attleboro’s Josh Montague had a team-high 15 points, Nate Gonsalves added 13 points and sophomore George Ladd recorded 10 points in his varsity debut. Stoughton, 39 @ Oliver Ames, 57 – Final – Holding a three-point lead at the break (25-22), Oliver Ames had a big third quarter to pull away from visiting Stoughton. The Tigers limited the Black Knights to just two points in the third quarter while scoring 15 points to take a 40-24 lead into the final quarter. Oliver Ames senior Ethan Eckstrom scored half of his career-high 16 points in the third quarter while Sean O’Brien and Jake Erlich each added 10 points in the win. Stoughton junior Myles Grigalunas-Powell scored a team-high 11 points for the Black Knights. Attleboro, 39 @ Canton, 53 – Final – Freshman Kiara Cerruti scored 20 points, grabbed eight rebounds, and had five assists on her varsity debut and classmate Fay Gallery had 16 points on four three-pointers in her first varsity action to lead the Bulldogs to a season opening win. 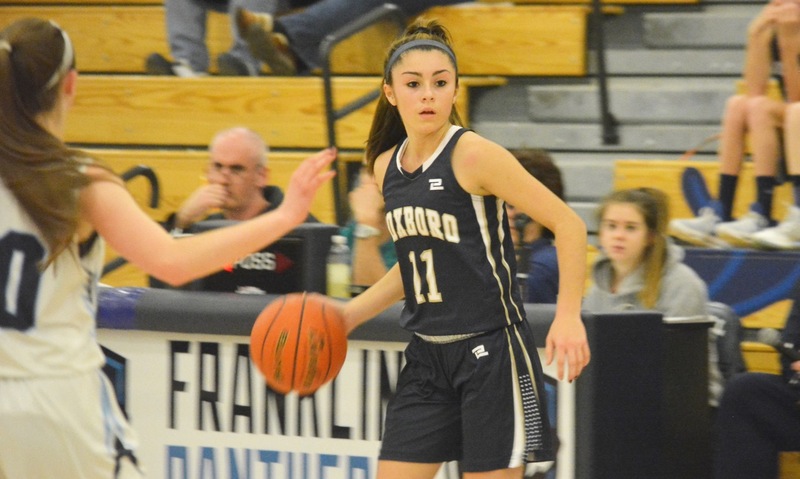 Mansfield, 50 @ Foxboro, 59 – Final – Katelyn Mollica led the way for the Warriors with 21 points, including four three-pointers and 9-of-10 shooting at the free throw line. Yara Fawaz and Abby Hassman each scored eight points and Chelsea Gibbons pulled down 12 rebounds in the win. Maggie Danehy scored 11 points and Mady Bendanillo had 10 for the Hornets in the loss. Franklin, 61 @ Milford, 20 – Final – Franklin jumped out in front early, leading 41-12 at halftime, and never looked back in both teams’ season opener. Ali Brigham scored 29 for the Panthers, who also got 10 points from Bea Bondhus and eight points from freshman Olivia Quinn in her varsity debut. Jillian Michelson scored seven points and Emma Lawrence had six for the Hawks. King Philip, 49 @ Sharon, 39 – Final – Shannon O’Connor scored 15 points for the Warriors in the season opener, despite sitting for a portion of the second half. Faith Roy added 13 points in the win and KP coach Amy Siggens praised Emma Glaser for her effort on the glass (nine rebounds) and on the defensive end. North Attleboro, 41 @ Taunton, 44 – Final – Taunton got balanced scoring to earn the win in the leaguer opener for both teams. Lily Patneaude scored 13 points and grabbed six boards for the Tigers, while Kelsey White added 12 points and snatched eight steals. Sonya Fernandez had nine points and 10 boards, Jaelyn Fernandez had three points and 15 boards, and Alex White had seven points and five assists for Taunton. Julia Feid was the top scorer for the Rocketeers with 19 points. Oliver Ames, 46 @ Stoughton, 33 – Final – Click here for a Recap and Photo Gallery from this game. Sharon, 58 @ Attleboro, 96 – Final – Attleboro’s Colton Parkinson qualified for states in both the 200 and 500 freestyle as the Bombardiers opened the season with a win. Attleboro’s 200 medley relay qualified for sectionals as well. Sharon, 80 @ Attleboro, 89 – Final – Attleboro’s Liz Salts qualified for states in a pair of events to help the Bombarders open the season with a victory. Salts qualified for states in both the 100 free and 200 free while Jackie Lynch-Bartek qualified for sectionals in the 100 breaststroke. The Bombardiers’ 200 free relay also qualified for states. Milford, 51 vs. Algonquin, 67 – Final – Click here for a recap and photo gallery of this game. Taunton, 53 vs. Cumberland, 36 – Final – Taunton opened the season with a double-digit victory over visiting Cumberland. Lily Patneaude dropped a team-high 20 points to pace the Tigers to the win. Alexa White added 11 points, Jaelyn Fernandez chipped in with 10 points, and Sonya Fernandez finished with seven points and 10 rebounds for Taunton. Attleboro, 60 @ North Attleboro, 38 – Final – Click here for a recap of this game. Foxboro, 56 vs. Bishop Feehan, 36 – Final – Foxboro senior Joe Morrison hit three three-pointers in the fourth quarter, helping the Warriors pull away from the visiting Shamrocks. Morrison also scored 12 of his game-high 25 points in the second quarter while the Foxboro defense limited Feehan to just four points in the frame, taking a 27-15 lead at half. Bobby Harrison added 15 points in the win. Franklin, 76 vs. Tech Boston, 67 – Final – Click here for a recap of this game. Mansfield, 69 vs. Brockton, 64 – Final – Mansfield senior Johnny McCoy poured in a career-high 35 points to lead the Hornets to a comeback win against the highly touted Boxers. Brockton held a 37-31 lead at halftime and took a 55-54 advantage into the fourth quarter. Mansfield outscored the Boxers 15-9 in the final frame. McCoy hit four three-pointers and went 13-for-19 from the line with five steals. Justin Vine added eight points while Damani Scott (five rebounds) and Ryan Otto each had seven points. Milford, 74 vs. Tantasqua, 65 – Final – Milford had a dominant third quarter, pouring in 26 points in the frame to turn a five-point lead at halftime (30-25) into a 56-42 advantage heading into the fourth quarter. Junior Brendan White had a team-high 16 points, senior Zach Tammaro added 12 points and Andrew Fraioli finished with 11 points. Kayden Kelley had a double-double for the Hawks with 10 points and 11 rebounds. Oliver Ames, 57 @ Walpole, 49 – Final – Oliver Ames seniors Jack Spillane and Matt Muir each dropped 23 points to lead the Tigers to the Walpole Hoop Classic Championship. The Tigers built a 32-23 lead at halftime with Muir, who notched a career-high, hitting three triples. Spillane and Noah Fitzgerald were named to the all-tournament team. Stoughton, 76 vs. Lincoln-Sudbury, 53 – Final – Stoughton senior Cam Andrews dropped 25 points and classmate Colin Sanda added 15 points to lead the Black Knights to a win over Lincoln-Sudbury. The Black Knights will play host Waltham in the final of the Jake n Joe’s Basketball Cup on Tuesday at 7:00. North Attleboro, 44 @ Attleboro, 56 – Final – Sam Pierce led the Bombardiers to the non-league win with a career-high 27 points. Jordyn Lako, Mackenzie Roberts, and Nyah Thomas each pulled down nine rebounds for Attleboro. Julia Santos was North’s top scorer with 12. Foxboro, 66 vs. Hanover, 59 – Final – Click here for a Recap from this game. Mansfield, 60 vs. Marlboro, 21 – Final – The Hornets turned on the defense in the third quarter, holding Marlboro to only three points, and scored 23 points themselves to break the game open. Ann Maher scored 16 points, knocking down five threes, for Mansfield, while Maggie Danehy added 10. Erin Daniel, Meg Hill, Sydney Mulkern, and Kara Bendanillo each added six points apiece for the Hornets. Mansfield will face Lowell in the tournament final after the Red Raiders upset Coyle. Stoughton, 52 vs. Norwood, 38 – Final – Aliyah Wright scored a game-high 20 points to lead the Black Knights, who closed out the regular season by winning 11 of their final 12 games. Stoughton, which held Norwood to only two points in the first quarter and seven in the opening half, also got 12 points from Val Whalen and nine points and 13 rebounds from Jordan Motley. Taunton, 56 @ Durfee, 47 – Final – The Tigers closed out the season with a non-league road win, after rallying from a 15-point second half deficit. Kelsey White paced Taunton with 15 points. Jaelyn and Sonya Fernandez each scored 11 for the Tigers, Hannah Moniz added nine, and Lily Patneaude had eight. Canton, 6 vs. Whitman-Hanson/Silver Lake, 2 – Final – Junior Lauren Fitzpatrick recorded four points to held the Bulldogs skate past Whitman-Hanson. Fitzgerald scored hat trick and had one assist in the win. FOXBORO, Mass. – Foxboro’s loss on Monday to fellow Div. 2 state title hopeful Hopkinton, which ended a 10-game win streak, delayed the Warriors booking a place in the state tournament, but the wait only lasted about 24 hours. The Warriors seemed to have a renewed energy coming off the loss and rolled to an 85-27 victory over visiting Taunton on Tuesday to book a spot in the postseason earlier than in any other of head coach Lisa Downs’ seven seasons in charge. The win also marked a milestone for Downs, who earned her 100th victory as coach of the Warriors. After a trip to the TD Garden last winter, Downs believes that this year’s team has the potential to be the best in her time as coach thanks to the talent and the togetherness in the squad. Senior Ashley Sampson, the Adelphi University-commit and reigning Hockomock MVP, was the star again on Tuesday with 26 points, six steals, and five rebounds, but the Warriors also got 19 points and nine rebounds from freshman guard Katelyn Mollica, eight points and five boards from Chelsea Gibbons, and six points and 10 assists from senior Lily Sykes. “We’re a little shorthanded, but they play so well together,” said Taunton coach Walter Harrigan, who was missing his two leading scorers, junior Lily Patneaude and senior MacKenzie Handrahan. Hannah Moniz (10 points) drilled a three off an assist by Jaelyn Fernandez early in the first quarter that cut the Foxboro lead to 5-3, but, as they have so many times this season, the Warriors turned it one and broke the game wide open. Foxboro went on a 12-2 run to close the quarter and then added the first 10 points of the second. Sykes knocked down both of her threes during that run and then assisted on a Sampson three. Sampson picked up a steal and raced down for a layup and Mollica knocked down a shot off another Sykes assist. Moniz hit a three and scored all five of Taunton’s points in the second but Shannon Smally added four points in the post, Lizzy Davis scored on an offensive rebound, and Mollica drilled a three to push the Foxboro lead to 41-10 at the half. The third quarter was even more prolific for the Warriors. Sampson scored plus a foul to kickstart a 10-point third, while Mollica buried a pair of threes in the quarter. Grace Tamulionis drilled a three and Abby Hassman scored four points, as Foxboro got points from nine different players. Taunton continued to play hard into the fourth quarter, despite trailing by more than 50. The Tigers were starting three freshman and brought a freshman and eighth grader off the bench. Sonya Fernandez scored and got fouled on a drive, Tori DaRosa knocked down a pull-up jumper in the lane and eighth grader Abigail Souza (who also played in the freshman and JV games on Tuesday) buried a straightaway three for her first varsity points. “You’ve got to take the positive from it over the last couple days, between injuries and everything going on,” said Harrigan about facing two of the top 10 teams in the state in a span of three days (the Tigers faced Coyle & Cassidy on Sunday). Nine of the 11 wins for the Warriors this season have been by at least double digits and six wins have been by more than 30 points. Monday against Hopkinton was the second loss of the season (and first to count in the MIAA standings) and Downs saw it as motivation for the second half. “We are going to have games like we had tonight and that’s honestly not going to prepare us for the Hopkinton game, but they realize they’re human, they’re beatable, and if we don’t show up any given night then that could happen,” she said. Foxboro (11-2, 9-0) will put its unbeaten league record on the line against Oliver Ames on Friday, while Taunton (6-8, 4-5) will try to get back to .500 in the MIAA standings when it hosts Canton on Thursday.